We commissioned an artist to create two stained glass windows for our bed and breakfast. They were installed this week. One of the windows is a rose and is located in our Rose Suite. The window’s colors match the colors in the room very well. The second stained glass window is located in our office and is visible from the street. 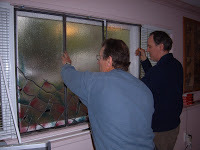 The picture is of the artist and installer with the B&B office’s window. Dru Malone is the stained glass artist. We have a third stained glass window which was in First Presbyterian Church of Macomb Illinois. My father grew up in that congregation. He walked under the window on his way to Sunday school class. When the church remodeled they sold some of the stained glass windows. This window is now located just above our guest living room. This entry was posted in Uncategorized and tagged art, improvements, windows by admin. Bookmark the permalink.